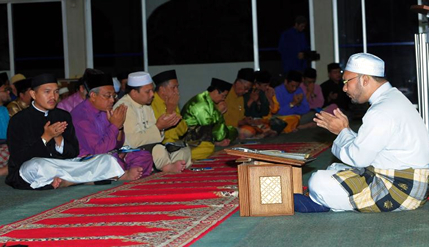 A doa selamat was held at the Universiti Kebangsaan Malaysia (UKM) mosque after the Maghrib prayer on 21 May, 2010 to mark its 40th anniversary. The function was attended by the Vice Chancellor, Prof. Tan Dato’ Dr. Sharifah Hapsah Syed Hasan Shahabudin and senior administration officers. The prayer was held as thanksgiving for the great strides made by the university and its academic and research staff that have made immense contributions to its good name. The university hopes those achievements will be an inspiration to all UKM staff to continue with their endeavour to further enhance its image already made in its march towards becoming one of the leading universities of the world and to be the pride of the nation.